Neuropsychiatric Disorders and Epigenetics is a comprehensive reference for the epigenetic basis of most common neuropsychiatric disorders. The volume is organized into chapters representing individual neuropsychiatric disorders, from addition to obesity contributed by leading experts in their respective fields. The epigenetic aspects of each disorder are discussed, in the context of the full range of epigenetic mechanisms including DNA modification, histone post-translational modification, chromatin organization and non-coding RNA. A particular emphasis is placed on potential epigenetic interventions, when the effects of environmental stimuli on epigenetic states is particularly relevant o disease. Recent discoveries in epigenetic research enabled by epic advances in genomic technologies have positioned the field for broad translation to therapeutic interventions for previously unmanageable disorders Neuropsychiatric disorders represent a prime target of epigenetic interventions as they are highly debilitating, often chronic diseases with enormous costs to society. 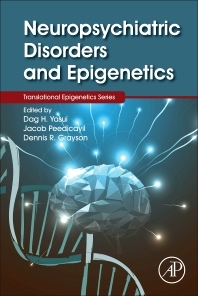 Thus, this volume will help define epigenetics as a key player in neuropsychiatric disorders, highlighting the full spectrum of epigenetic mechanisms underlying such disorders and introducing the vast range of epigenetic therapies under development. Dag Yasui is senior project scientist at UC Davis’ Department of Medical Microbiology and Immunology. His current research program is in the field of chromatin and gene expression regulation in autism spectrum disorders. Jacob Peedicayil has published 46 review papers, 3 book chapters and is engaged in various editorial review boards and journal positions. His interests include theoretical research in psychiatric epigenetics and muscle-based pharmacology. Dr. Grayson has been interested in mechanisms associated with gene expression for over 20 years. He joined the laboratory of Dr. James E. Darnell, Jr. at the Rockefeller University on 1984 to study cell-type specific transcription factors. This led to the identification of HNF3A as a hepatocyte nuclear factor important for activating the expression of multiple genes in hepatocytes. In 1988, Dr. Grayson joined the Fidia-Georgetown Institute for the Neurosciences and with the support of Dr. Erminio Costa, initiated a program in studying gene expression in neurons. From 1994-1998, he moved to the Allegheny University of the Health Sciences in Pittsburgh and developed a program in molecular psychiatry. He continued his interests in psychiatry and joined the Psychiatric Institute in 1998. This represented a unique opportunity to join his long time collaborators, Drs. Costa and Guidotti to pursue molecular underpinnings of schizophrenia. Dr. Grayson has received NRSA post-doctoral support, R01 and K04 funding from the NIH over the years. He has published over 100 papers in peer-reviewed journals and actively reviews NIH grants and post-doctoral fellowships. In addition, Dr. Grayson has been invited to speak at numerous national and international meetings.